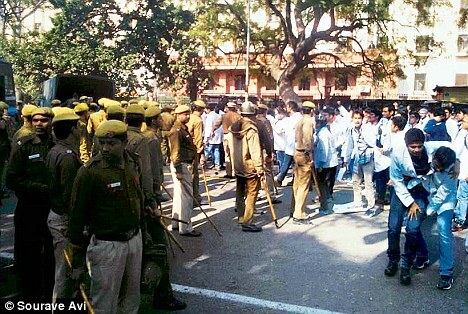 Wednesday was a day of shame for Delhi Police as they fired water cannons and lathi-charged a crowd of medical students who were peacefully protesting against the proposal to increase the duration of the MBBS course. At least 2,000 students from Delhi's top medical institutions, including AIIMS, Lady Hardinge, Maulana Azad Medical College and Vardhman Mahavir Medical College, were protesting in front of Nirman Bhawan against the government's plan to extend the course's duration from 5.5 years to 7.5 years. About 40 students were rushed to nearby hospitals after the police thrashed them; even girls were not spared. Following the incident, resident doctors and students from all the five medical colleges have gone on an indefinite strike. The protesting students have demanded that their representatives be allowed to meet Union Health Minister Ghulam Nabi Azad. The students desire that instead of increasing the course duration, the compulsory one-year rural posting is either incorporated into the existing MBBS course structure, or treated as part of the PG curriculum. "The government had promised it will keep us in the loop. But it has gone ahead with its decision to increase the duration. We are not against rural posting and internship. We only want it to be included in the curriculum," said Dr. Kushagra Pathak, president of the students' union, AIIMS. Sourave Avi from UCMS explained how the proposal will affect aspiring medical students. "India is in desperate need of doctors, but students don't want to get into medicine as it takes at least eight years to complete studies. If you extend this too, why would anyone want to study medicine?"